Leadpages is one of the most popular landing page builders for small and medium-size businesses. Calling itself “the most effective, affordable way for small businesses to connect with an audience, collect leads, and close sales,” Leadpages promises to help you build landing pages, pop-ups and alert bars easily. In fairness, that makes Leadpages sound like pretty much every other landing page builder on the market. So, in this review, we’re going to take a closer look at where the platform shines and where it’s kind of overrated, compared to the other tools you have available. Before we look at how much Leadpages is going to cost you and what you can do with it, let’s dive right into the pros and cons of this platform. We’re basing these on our experiences with alternative platforms such as Unbounce and Instapage. Essentially, you get a huge amount of landing page templates and Leadpages is generally very easy to use. Sadly, the quality of these templates doesn’t really stack up to the likes of Unbounce and Instapage but this wouldn’t necessarily be a problem if Leadpages allowed you to customise its standard templates more extensively. Sadly, this isn’t the case and you need to use Leadpages’ drag-and-drop builder to get highly customisable results. This in itself wouldn’t be a major problem either but the builder is quite sluggish and this detracts from an otherwise easy-to-use platform. There are some nice features in there, though – like the fact you can filter templates in order of their conversion rate (based on Leadpages’ data) and the optional pop-ups and alert bars. Leadpages has three packages available: Standard for new businesses, Pro for growing businesses and Advanced for agencies. There’s no option for enterprise brands but this platform really isn’t aimed at larger businesses at all. There are three different payment models with Leapages, allowing you to pay monthly, annually and on a 2-year basis – each option offering a lower equivalent price point. If you compare that to Unbounce (plans start at $79/mo) and Instapage (plans start at $99/mo), Leapages clearly aims to offer smaller businesses a cheaper alternative. Here’s what you actually get for your money. In terms of features, Leadpages packs a lot into its platform for a reasonable price. The only complaint I have is the fact you don’t get unlimited A/B testing on the Standard version, despite the fact you can create unlimited landing pages. Yes, the company needs to differentiate its plans but reserving this essential feature for its more expensive plans largely cancels out the price advantage over Unbounce and Instapage. One huge advantage Leadpages has over the competition is that fact you have no restriction on traffic, regardless of which version you use. With Unbounce, for example, you’re limited to 500,000 unique visitors per month and you’ll have to sign up to the enterprise version for anything more than that. You don’t have this limitation with Leadpages, which is great if you have a lot of traffic coming to your site. In real world practice, though, very few of the small businesses Leadpages is targeting will generate more than 500,000 unique visitors on a monthly basis. What can you do with Leadpages? Leadpages offers three core products, all of which you can use as much as you like on all versions of its platform: Lead Pages (landing pages), Pop-Ups and Alert Bars. Of course, Leadpages’ primary function is a landing page builder and you’ll be familiar with the overall process if you’ve ever used a tool like this or a theme-based CMS like WordPress. Essentially, you choose your template, add your content and you’re pretty much good to go. Leadpages has a huge library of templates to choose from as well. Quantity doesn’t always result in quality, though, and Leadpages’ templates always felt like they were behind the likes of Unbounce and Instapage – until the last couple of years, that is. I still think Leadpages has some catching up to do but its template designs have definitely improved in recent years. Unfortunately, your customisation options are highly limited when you use a standard template and this is where Leadpages drag-and-drop builder made an exciting addition to the platform. However, I’ve found the web app to be sluggish when I’ve tried it myself and this isn’t something you want from a tool designed to make life easier. Next up, we have Leadpages’ Pop-Ups products, which you can implement on your landing pages and any other page on your website. These are exit-intent pop-ups that trigger when a user looks like they’re about to leave your website. The idea is to capture leads from traffic that would otherwise slip through your fingers. Leadpages make these incredibly easy to set up and you won’t need to write any code. Unbounce also has a product to help you create exit-intent pop-ups with no coding but you don’t get this feature with Instapage. Leadpages’ Alert Bars allow you to get a message across to users without interrupting the user experience in the same way full-page pop-ups do. They’re a relatively mobile-friendly approach and they provide a simple solution for adding CTAs to pages that might not otherwise generate leads. Once again, Leadpages makes these incredibly easy to set up and you won’t need to deal with any code or plugins to use Alert Bars. Combined with exit-intent popups, these can make a real difference to your landing page conversion rates. How does Leadpages compare to the competition? Leadpages gets off to a strong start with affordable pricing, solid features and a decent selection of landing page templates – a tempting proposition if you’re comparing it to alternatives like Unbounce and Instapage. Unfortunately, Leadpages quickly loses out if you actually start using other landing page builders. Unbounce is more expensive than Leadpages but you get unlimited A/B testing on every version of its platform and you also get an extensive range of optimisation features. Dynamic text replacement is a particularly great tool. 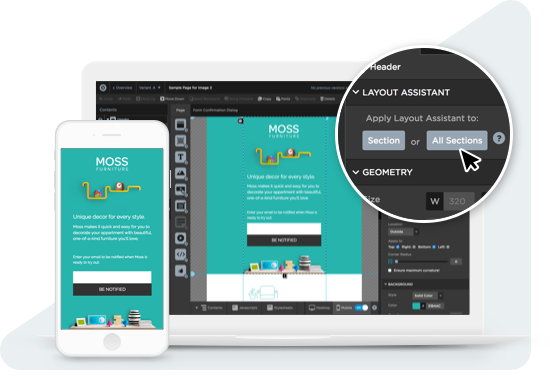 Unbounce’s page builder is superior as well, truly making it fast and easy to build and customise landing pages. This is one area where Leadpages really frustrates and it’s hard to forgive this in a landing page platform. Something else that ruled out Leadpages for us was its limited form options. In fairness, Unbounce’s built-in form options were also under-par for us but what you can do is embed forms on Unbounce pages and this allows us to place our highly-optimised Leadformly forms on any landing page we create. We can’t do this with Leadpages. Instapage also gives you unlimited A/B testing on its basic “Core” plan and its landing page builder is probably the best I’ve used so far. One of Instapage’s standout features is its heatmapping tool. This is an invaluable optimisation tool for landing pages and you’ll need to integrate Leadpages or Unbounce with a third-party platform for this, such as Hotjar. You can read our Hotjar review here. Leadpages aims to provide a landing page builder for smaller businesses and its pricing policy looks pretty suitable at a glance. There are a few things it needs to fix, though. If it makes A/B testing fully available on every version of its platform, then the affordable prices of its Standard plan become a genuine asset. At this point, you basically have to pay up for its Pro version and this puts you close to Instapage prices. The other two issues I have is the lack of customisation options on Leadpages’ templates, which makes it difficult to match the branding and design on existing websites. Then we have that page builder which could have solved those customisation issues, if it wasn’t on the sluggish side. Final verdict? Leadpages could be a great option for smaller businesses if it fixes a few key issues.